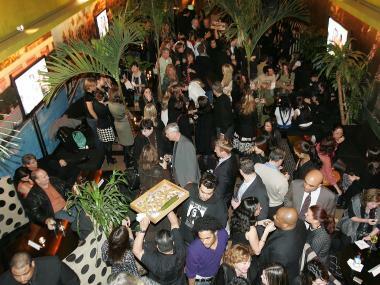 The old Bungalow 8 on West 27th Street held hip, celebrity-filled parties like this one in 2006. CHELSEA — Don't put your dance shoes on just yet, Lindsay Lohan. The State Liquor Authority has frozen the liquor license of a soon-to-be-reopened Bungalow 8 after the neighborhood's community board alleged that the owners failed to mention the identity of the upcoming hot spot to avoid scrutiny, officials said. The move came shortly after Community Board 4 learned in reports last week that the nameless gastropub it signed off on at 357 W. 16th St. in January was actually the future home of a reincarnated Bungalow 8, and that the former celebrity club's owner, Amy Sacco, would consult on the project. "Bungalow 8 — the name itself, the caché around it as a velvet-rope, late-night nightclub lounge with bottle service ... that is not what the BLP Committee and the full board thought they were voting on when they voted to approve it," said CB 4 Chairman Corey Johnson, who fired off a letter to the SLA on Monday asking the agency to freeze the approved license until Bungalow 8's owners appeared before the board again. Sacco's old Bungalow 8 on West 27th Street offered a whirlwind of celebrity sightings, bottle service, and complaints from neighbors dating from its 2001 inception until 2009, when it shut its doors. In its heyday, the club hosted celebs like Lindsay Lohan, Paris Hilton, and David Beckham, and spawned a spin-off with the same name in London, which has a similar vibe. "This new information that we received on the proposed Bungalow 8 name, we really believe changes what was presented to us," said Johnson, who called the application a "bait and switch." On a supporting document filed with the application, the lawyer for the new Bungalow 8 — led by restaurateurs John Meadows and Curt Huegel of LDV Hospitality, which also owns La Promenade and Scarpetta — said the new spot, whose name was "pending," would be a "restaurant," the document said. He checked off the part of the liquor license application that said they would steer clear of promoter-led parties, not allow dancing, and limit the number of security guards on hand to just two bouncers at the door, according to the document and angry board members. "What they’re representing to us, which I have a really hard time believing, is that they want to resurrect the Bungalow 8 brand and make it into a lifestyle brand as a gastropub," said Paul Seres, the head of the board's Business Licenses and Permits Committee and head of the New York Nightlife Association. "The problem is that the Bungalow 8 in London, the Bungalow 8 that was on 27th Street and Amy Sacco have nothing to do with a gastropub, nothing to do with food, only to do with bottle service, Page Six and celebrities." LDV Hospitality could not immediately be reached for comment. SLA spokesman Bill Crowley said that the agency thought the matter should go before the community board again. "They reached out to us and asked us to hold off," Crowley said. "We thought it was reasonable to have them meet with the community board again at their meeting on May 8. It's possible the stipulations could be changed." It's not clear when the Bungalow 8 name became attached to the project. According to Johnson, the club's owners maintained that the location would be nothing more than a low-key gastropub with the Bungalow 8 name at a meeting called Wednesday by CB 4 officials and attended by the club's owners and attorney, along with security officials and a representative from the NYPD's 10th Precinct. Johnson said the club owners refused to budge on the board's concerns, and would not back down on including a provision against bottle service. The owners also agreed to a security plan that only has two guards posted at the entrance, but if the club plans to have bottle service, the board said it wanted to see that plan revamped with security inside the club as well. Community members say the area is already hopping with enough nightlife, with the popular Dream and Maritime Hotels, drawing throngs of partygoers at Ninth Avenue and 16th streets. The liquor license, which has been approved by the SLA, is on hold pending the outcome of the community board meeting.